Dramatic testimony from school shooting survivors drew a larger than usual crowd of a few hundred protesters at the monthly vigil last Saturday outside National Rifle Association headquarters in Fairfax, VA.
Jenny Wadhwa, a survivor of the Sandy Hook Elementary School shooting in 2012, likened the tragedy to the Holocaust and vowed, “We will never forget”. Aalayah Eastmond, a survivor of the Marjorie Stoneman Douglas High School shooting in March, also pointed out the parallel. Ironically, when the shooter entered her classroom they were studying the history of the Holocaust, she said. In addition, some protesters at the monthly event had a personal history of gun violence. Alice Englert came from Warrenton to honor her grand-cousin, Daniel Barden, who was a Sandy Hook victim. Phyllis Klein’s son was a senior at Virginia Tech during the shooting in 2007. With each following incident she finds the nightmare continuing, and getting worse. This was her first protest, but she plans to make it regular event. Many of the activists, who gather on the 14th of every month in front of the NRA, have been advocating for gun control for years. 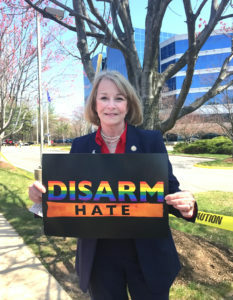 Dorothy Pech of Vienna began protesting against gun violence with the Million Mom March 18 years ago. After all this time she remains hopeful, especially with the new participation of the young people. “They give me the chills, they’re so wonderful.” In her 80’s she’s not ready to give up, explaining that nothing will happen if we don’t keep trying. The youngest speakers were 5th graders from George Mason Elementary School in Alexandria. Veterans of the March for the Our Lives, a protest at the White House and a walk-out at their school, the young activists each spelled at their name so they too would not be forgotten. For more information on the monthly vigils, click here. 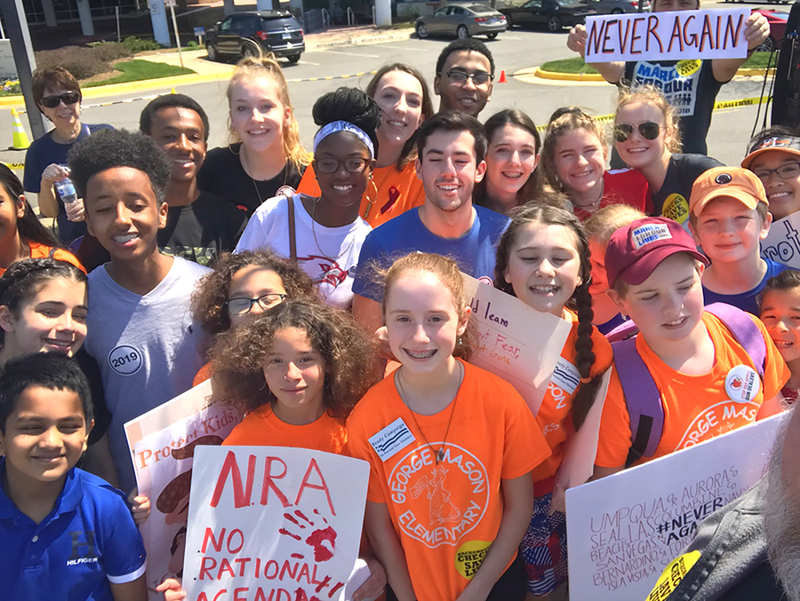 Photo above story is of 5th graders from George Mason Elementary School in Alexandria and other area students attending the vigil at NRA Headquarters in Fairfax, VA.